The violent protests in Charlottesville, Virginia, last weekend, revived debate over the name of an iconic south Georgia landmark. Span the Gap, a group of Chatham County activists and artists, say the two mile Savannah bridge honoring former Governor Eugene Talmadge serves as a painful reminder of the three-term Democrat's most controversial policies. "The Talmadge name on the bridge has distressed some Savannah residents, particularly most African Americans and whites that believed in racial equality, since 1954," Span the Gap spokesman Ron Christopher stated. Eugene Talmadge Memorial Bridge was erected across the Savannah River in 1991 to replace an earlier incarnation built nearly four decades before. Talmadge, the structure's namesake, was one of Georgia's most polarizing elected officials. His twenty years in public service, first as state agriculture commissioner and then governor, were marked by accusations of corruption, the University System of Georgia losing its accreditation and an ardent defense of segregation. Local Savannah officials support re-naming the bridge, passing a resolution as recent as 2013 urging state lawmakers to do so. A bill, however, was never introduced due to disagreements among the Savannah-Chatham legislative delegation. 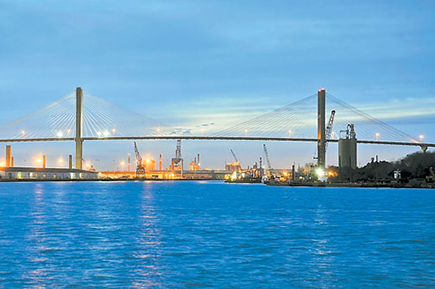 State Representative Ron Stephens (R - Savannah) told WJCL-TV, in 2016, "We as a delegation couldn't come to a consensus on changing the name since it was a United States senator, and we left the bridge alone." Christoper says Span the Gap's latest attempt to remove Talmadge's name from a popular Savannah backdrop is a continuation of the 2013 effort. "For Savannah, this is an opportunity to make an affirmative statement that we do not support any notion of white supremacy," said Christopher. "Charlottesville showed, among other things, how important it is to clearly renounce an imperfect past." Span the Gap is hosting a symposium, September 5th, to discuss re-naming the bridge. Former Savannah Mayor Otis Johnson will serve as moderator of a panel that includes former Georgia state NAACP President Francys Johnson.